Thank you so much for your sharing this with me. It is somewhat encouraging and very comforting to know that I am not alone in the struggle. All of these points have been a struggle at one time or another. I want to use my God given talent and not have negative thoughts. One problem I have had in trying to transition from traditional to contemporary music is the chord format……no music…..lyrics with a chord over certain words …no time signatures or information that written music provides. I have managed to “learn” chords but the struggle is real. Old dog….new tricks. Again….thank you for your input and look forward to your wonderful arrangements! As one who was a church musician for many many years, I can relate to most of the responses in this post. 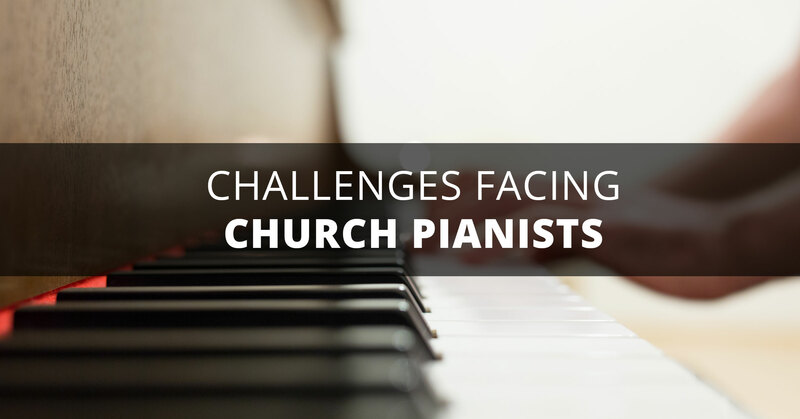 I am fortunate to be in a church that realizes the importance of letting piano students get experience, and many of my students have benefited from this. I have started to teach my students how to read lead sheets. I want them to be useful with their piano skills. I also make them play simple hymns in every key utilizing the chords they have learned in their scale work and theory–this also develops the ear. As to the difficulty level of “offertory” type arrangements, a “normal” piano student does better with an intermediate level piece that is not too long. Their attention span lapses and they lose their motivation if a piece is too long or involved. Personally I would rather play an upper intermediate or early advanced piece as I can relay the message of the song better if I’m not worried about “getting in all the notes.” More gifted performers probably prefer harder and could carry them off. Our choir has sung your arrangements from time to time. I appreciate what you are doing and hope the Lord continues to bless you. I am one of those “lone” church pianists and doing it for a little over 30 years. It’s pretty much a given that I will show up whenever there is a meeting or special service going on. It does tend to get me a little frustrated and makes me feel somewhat guilty if I say no. But I am grateful for the gift God has given to me and I want to use it for His glory. Our church is a small nondenominational church so alot of the proper “manners” of quietness and worshipfulness of the congregation coming into the sanctuary goes out the window. I just try to keep any prelude I do, very simple and nonflashy. The concern I’m having with any prelude I may do is trying to keep the music relevant to my audience. Today’s audience is not so much into the hymns that I grew up on and love, but rather with the “praise” music. I was told in my college music classes that if we are using praise and worship songs in our singing, we should also balance them with the meat of the great hymns of the faith. For me, I don’t tend to use a practiced written arrangement for preludes…I just sort of take a hymn and simply embellish it for the few minutes I have. I would like to have an intermediate level song with interesting chord structures that I could put together in say, an hour of practice so I could play it quietly in the background on Sunday morning. I’m having trouble finding praise and worship songs that are in a simple arrangement. I don’t want to only play hymns for the older members but I want to also make it interesting for the younger listeners as they come in. I used to play more difficult piano solos when I was a little younger, but I am at the point where I want to keep things a little simpler. Perhaps we could bounce some ideas off of others within this blog and share what has worked for each. Thanks for this avenue of sharing.